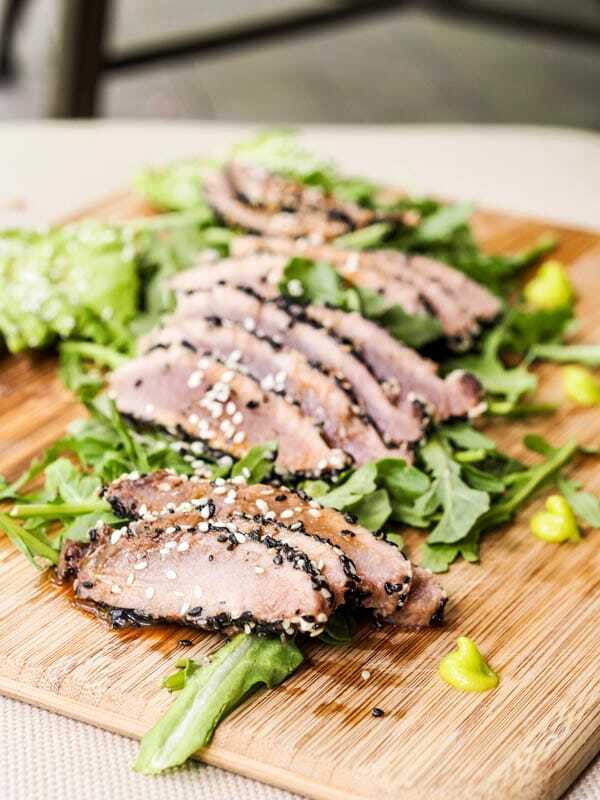 This sesame crusted ahi tuna is super simple to make at home and makes for an uber sophisticated Asian themed meal. Dip into an incredible tamari based ahi tuna sauce for the ultimate flavor combination. Ready in under 30 minutes. My love for food has been passed down to me by my parents. They are master food lovers and I can proudly say that I now carry this trait myself, and really live it to the fullest. I do not even want to add up what the grocery bill around here is. Between frequent stops to Wegman’s, Roche Brothers, Whole Foods, and Trader Joes, it looks like we’re really spreading the wealth around and keeping these stores in business. Oh and recently there’s been a new addition to the standard rotation of food stores – a wholesale seafood market. My dad found out about a market in Boston that sells fish and seafood in mass quantities – this is where the restaurants shop for their fresh supplies, and so now he’s been shopping there too. The last seafood market outing came in at a whopping $500 and include huge quantities of shrimp, oysters, tuna, soft shell crab, salmon and striped bass. It was two enormous bags filled with all things sea related. I was seriously amazed everything fit into the freezer (which was far from empty to begin with). With that said we ended up with a 24 pound piece of tuna. Yes, TWENTY FOUR POUNDS. I could barely lift the piece myself, and slicing it into steak took a bit of time. But now, well I’ve got a huge amount of neatly packaged tuna stacked up in the freezer. What to do with so much tuna? Make seared sesame crusted ahi tuna of course! I was intimidated by this dish at first, thinking I needed some pro fish skills to tackle this dish head on, but after browsing the internet I realized it was all a lot simpler than it seemed. 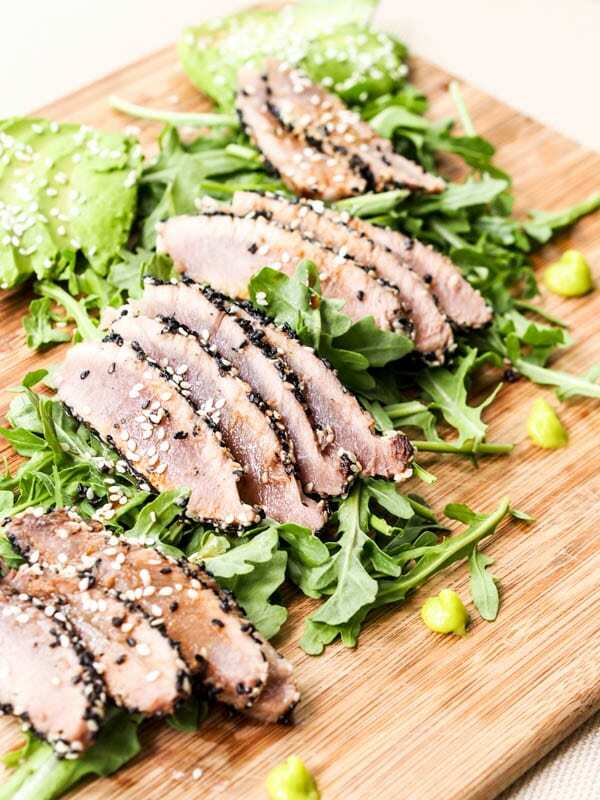 Pretty much all you need to do is drizzle a bit of tamari onto the tuna steaks as a simple ahi tuna sauce marinade, rub that in and then dredge in a generous amount of sesame seeds on all sides. For full aesthetic effect, make sure to have both white and black sesame seeds on hands — it just looks so pretty that way. Then make sure to lightly sear the steak on all sides in a hot pan with hot oil. Feel free to cook the tuna to your liking but I prefer mine nicely pink on the inside with a bit of a sesame seared crust on the outside. This I’ll leave up to you. Using the sharpest knife around thinly slice and voila your fancy dinner is ready. To serve I plated this with arugula, thinly sliced avocados, and cucumber and whipped up an Asian tamari based ahi tuna sauce for dipping. The ahi tuna sauce is seriously incredible. It’s light, yet salty, yet with a deep complexity in flavor from the oils, wine and vinegar – so good. Add a dollop of wasabi to if that’s your thing (I LOVE it)! 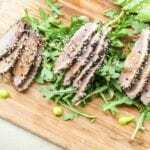 Sesame crusted ahi tuna with an amazing ahi tuna sauce makes for a perfect appetizer or light and simple dinner. Sophistication without the fuss. Sesame crusted ahi tuna is super simple to make at home and makes for an uber sophisticated Asian themed meal. Dip into an incredible tamari based sauce for the ultimate flavor combination. Ready in under 30 minutes. Drizzle tamari over tuna steak and rub in with your hands. In a plate combine white and black sesame seeds and mix. 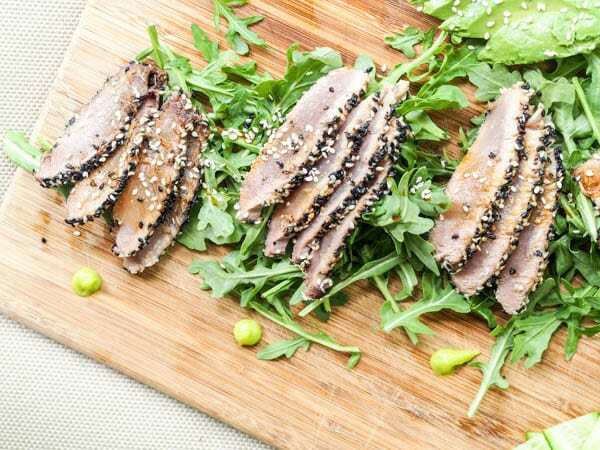 Dredge tuna steaks in sesame seeds until coated on all sides. Heat pan over medium heat and add tablespoon of olive oil. Once hot, add the tuna steaks and cook on each side until sesame seeds are toasted and tuna has a nice crust formed on the outside. Using a knife check the center to see how pink it is and cook more or less, depending on your preference. Remove from heat, let sit for a few minutes and thinly slice with a sharp knife. To make the sauce combine tamari, ginger oil, sesame oil, lemon juice, rice vinegar and white wine. Whisk until smooth.